Chinese researchers have developed therapeutic nanoparticles that attract and trap the Zika virus in infected mice. The approach could potentially provide a much needed therapy for the virus in humans. Transmitted by mosquitos, Zika hit the headlines in 2015 when the largest ever outbreak occurred in Brazil and swiftly spread across the Americas. This led scientists to connect the virus to neurological disorders, including Guillain–Barré syndrome, and birth defects including abnormally small heads and underdeveloped brains. Before scientists had made the link to these serious conditions, it was long thought that the Zika virus was relatively benign. Only one in five infected people experience feverish symptoms and the illness is generally mild and brief. The upshot was there was no vaccine or treatment for it and efforts to develop one have been ongoing since the 2015 outbreak. The nanodecoys comprise a gelatin nanoparticle core coated with a mosquito host cell membrane, which mimics the type of surface that the Zika virus naturally attaches to for it to invade a host cell and replicate. 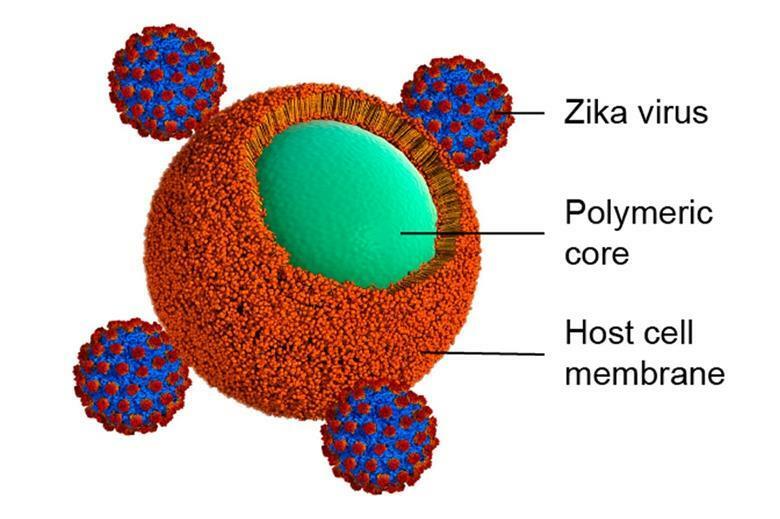 Zika virus pathogens that bind to the nanodecoys’ outer membrane, however, have no cell to enter and thus become trapped, preventing their replication or ability to infect genuine host cells. The gelatin core of the nanodecoy stabilises the cell membrane to help it survive longer in the bloodstream to mop up as many Zika virus pathogens as possible. The team’s experiments with mice revealed that the nanodecoys neutralised inflammatory responses and degenerative changes caused by the Zika virus. What’s more, by trapping Zika pathogens on the nanodecoys, the researchers found that the Zika virus could not pass through the semi-permeable placental barrier between the pregnant mouse and its foetus, thereby suppressing Zika-induced foetal microcephaly.